I love facial hair on men.. so this new hipster rage of mustache's really speaks to me!! With my Italian hubby (who wishes I'd let him shave it all off - yet I love his goatee, lol) and his chromed out facial hair.. this easy, fast, punch-art, hand-stamped card was designed to honor the man who fathered our 6 amazing kids!! So Happy Father's Day (though this hand-stamped card works for so many reasons) and I 'mustache' you to smile and have a delightful day!! OK so my husband is a simple man. He isn't all about the frills. 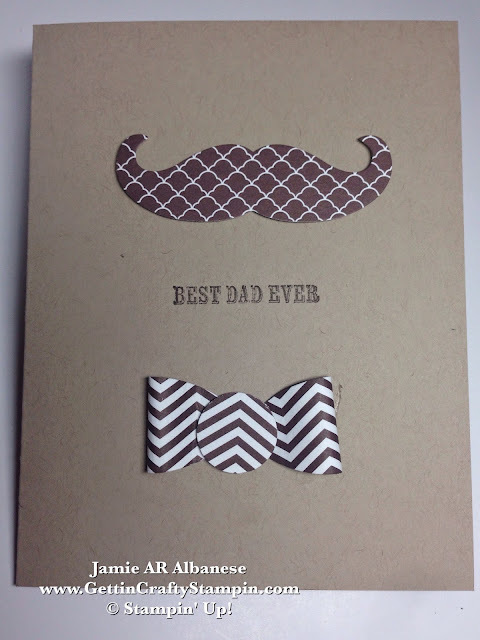 This clean, warm card is ideal for the father of my kids! 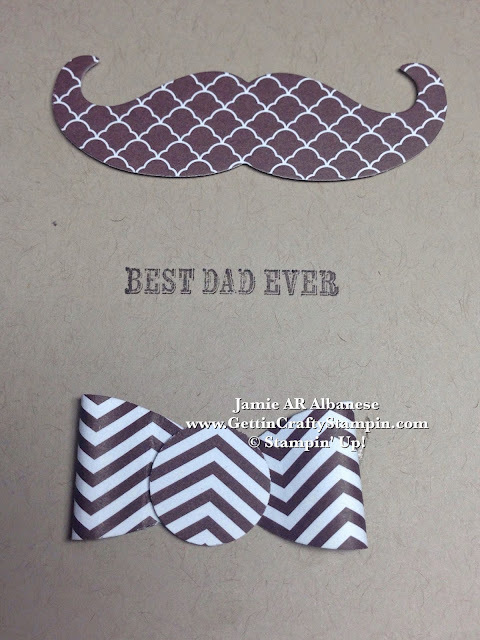 Simply create this Mustache using the NEW Framelit on the Magnetic Platform and Big Shot Die-Cutting Machine! I know - it is sooo cute!! Even if you aren't hipster (my hubby isn't) this mustache is a fun way to play!! I LOVE the Bow-Tie look. Here it's super easy to create!! I used to make these bows with the aide of my Hot Glue Gun and yes, yes - I'd get burned (Carol - I know you are cringing right now - lol). With the New Fast Fusion adhesive you can create this punch art bow with ease and it will stay together!! Simply Punch the same Chocolate Chip Designer Sheet from the Neutrals Stack and use the opposite side! No waste! Fold the Ovals in 1/2 for each side of the bow. Add the 3/4" Circle Punched pattern to the center for the 'knot'. This is an easy 3D bow and with our Ovals Collection Framelits - you can create bows in a plethora of sizes!! 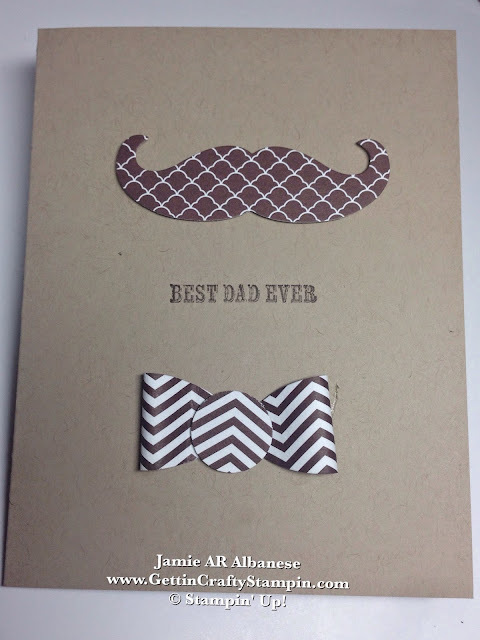 We created this card at our recent New Catalog Party and Card Class - did you miss it?? Don't Miss Out on Upcoming Classes - JOIN US!! See the NEW and Full Line-Up of FUN waiting for YOU! 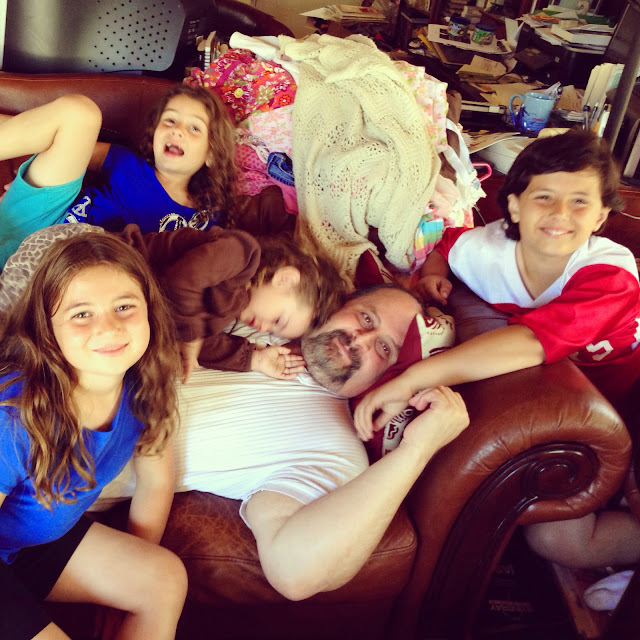 Here the youngest four pile up on their dad for Father's Day Loving. With a busy life of kids, work, home, church, etc - my husband is super dad. His simple desires (ummm - like Tommy's Burgers, a California Chili Burger/Fry iconic establishment for his Father's Day meal - lol) his love of family and our life - he deserves a card that says it all. Best Dad Ever - my kids have a dad who sacrafices so much for them... and his simple needs are met with this simple card. A card doesn't have to be elaborate to mean the world to a person. I 'mustache' you to have FUN this Father's Day... sometimes it's the simple moments in life that are the best.